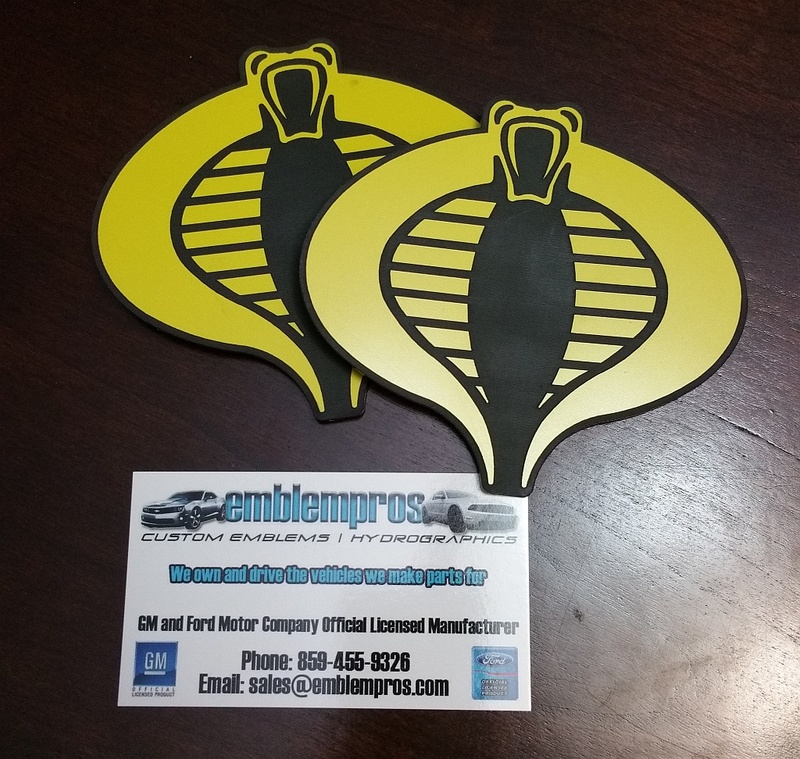 I got some custom Cobra emblems made for my car by the people at EmblemPros. They’re made of thick vinyl and have a backing of 3M double sided tape. I’ll be putting them on as soon as it gets a little warmer outside (or I get my hands on a hair dryer). In the summer I may put on side spears just above the rocker panels. I’ve also got custom Cobra badges on their way which will go below the Camaro badge on both sides. 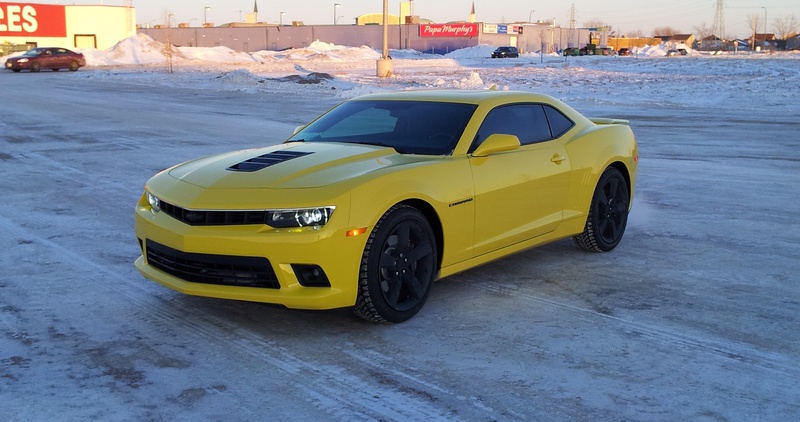 I just bought a yellow 2014 Camaro 2SS/RS. 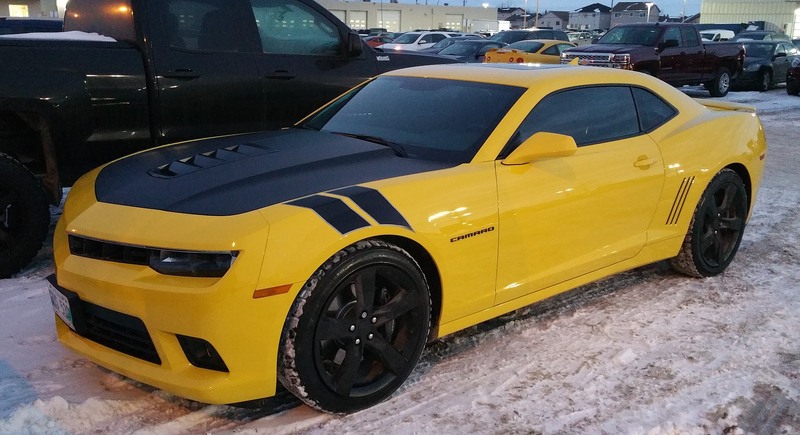 6.2L, 8 cylinder engine. 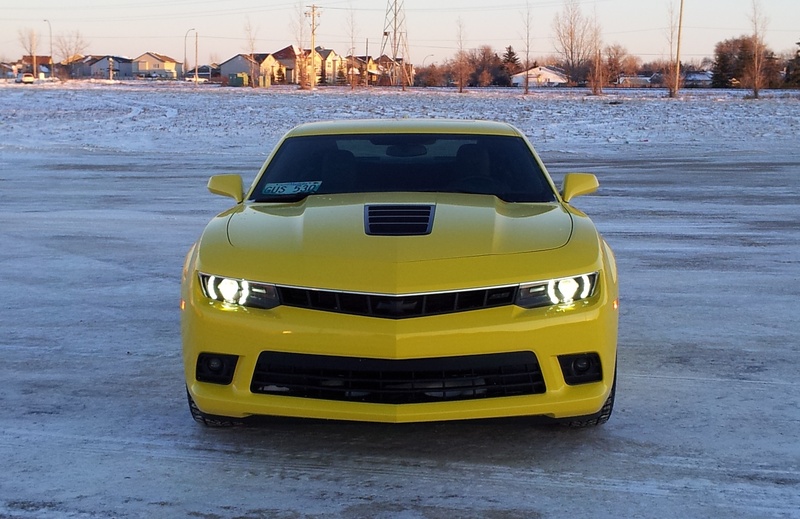 426 horsepower. 420 lb-ft of torque. She’s a beast! I’ve got some decals on the way which should really sharpen things up and personalize the car a bit. I still don’t know what personalized license plate I will get. 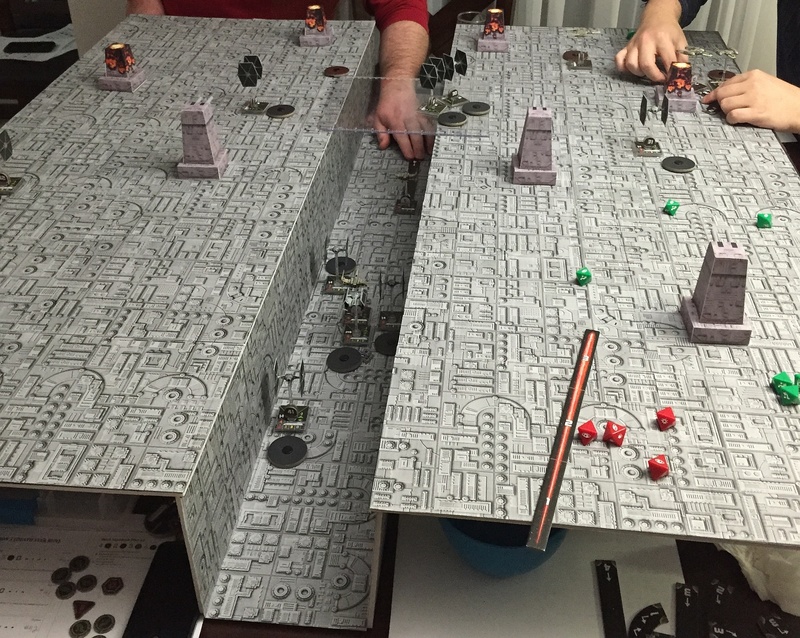 This past New Year’s Eve, I hosted an epic session of the X-wing: Miniatures Game using the Death Star Trench play mat that my friends and I recently built. 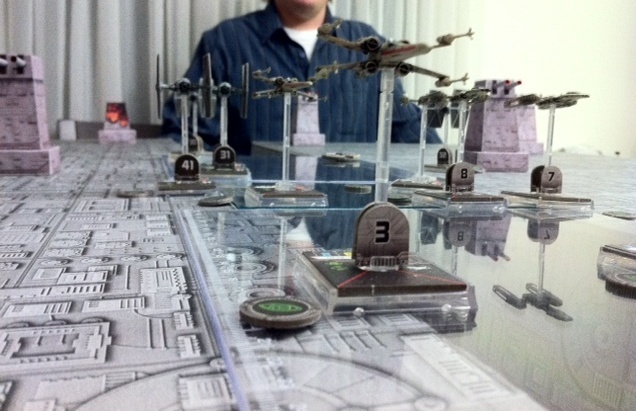 The Rebels had four groups of three X-wings and two groups of three Y-wings. Only three groups could be in play at a time. When one group is wiped out, another group can enter play. Each group is worth 80 points. 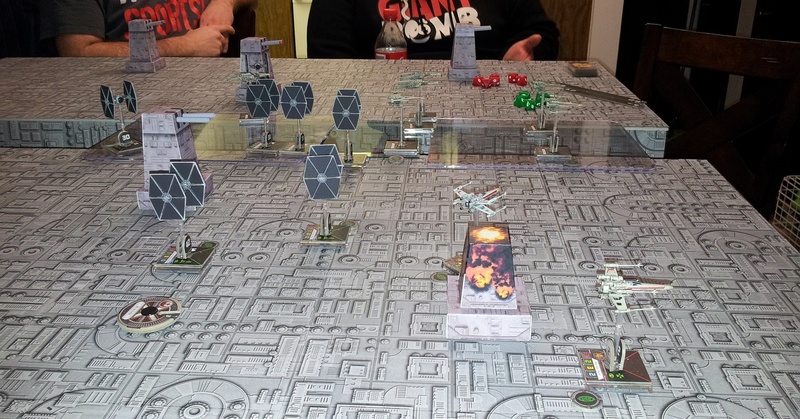 The Rebels win when they successfully blow up the Death Star. 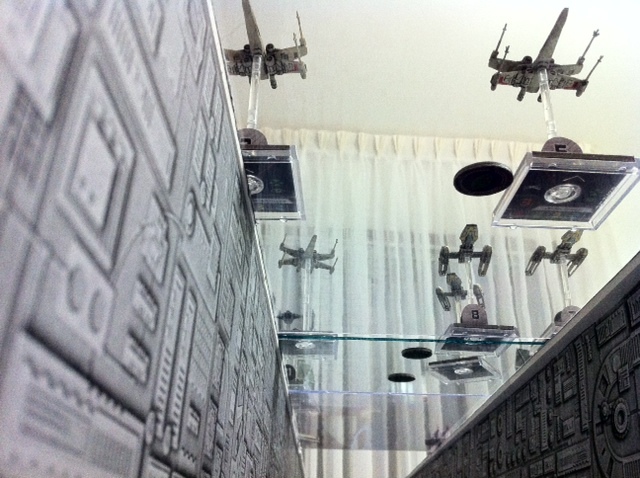 The Empire had unlimited number of Black Squadron TIE Fighter groups. 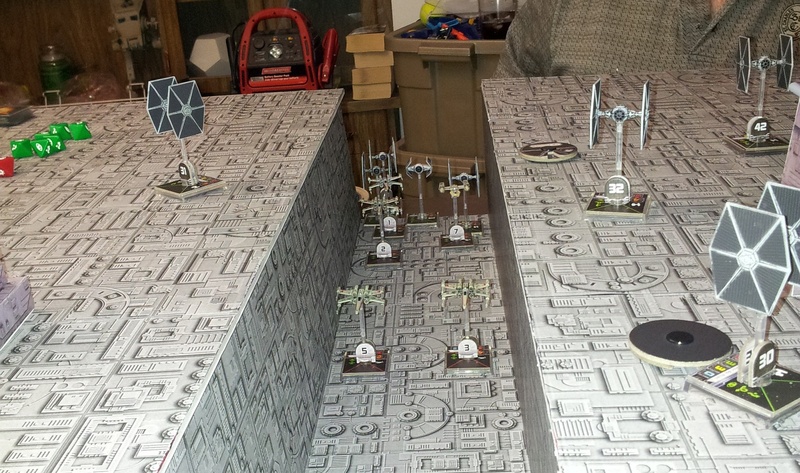 Each group consisted of four TIEs and is worth 80 points. Only two groups could be in play at a time. 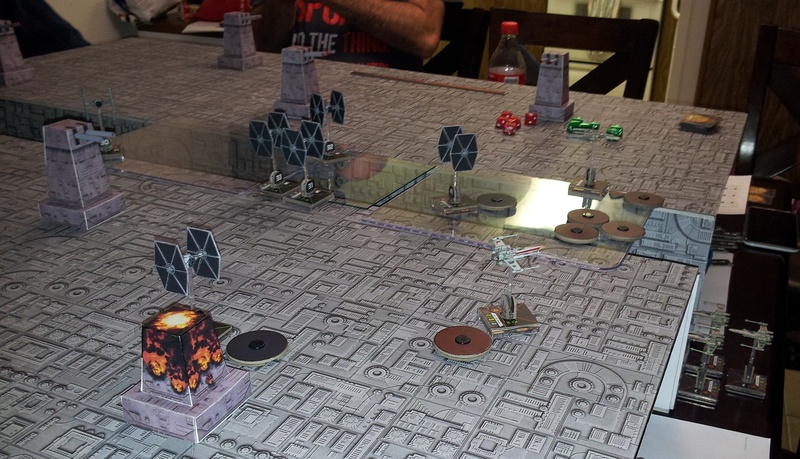 The Empire also had a special group consisting of Vader, Backstabber, and Mauler Mithel (also worth 80 points). 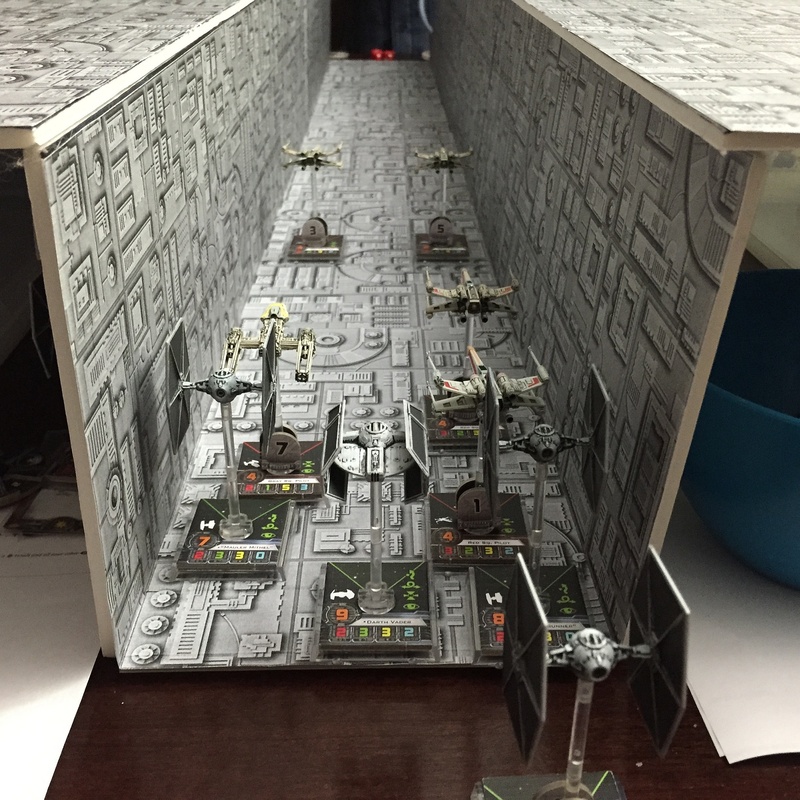 This group enters play in the trench the next turn after the first Rebels enter the trench. 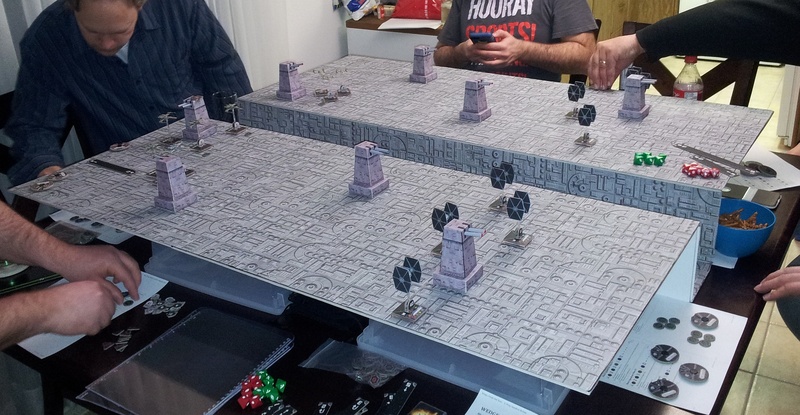 Lastly, the Imperials had eight turbo laser towers, each placed at least range 2 from any other tower. 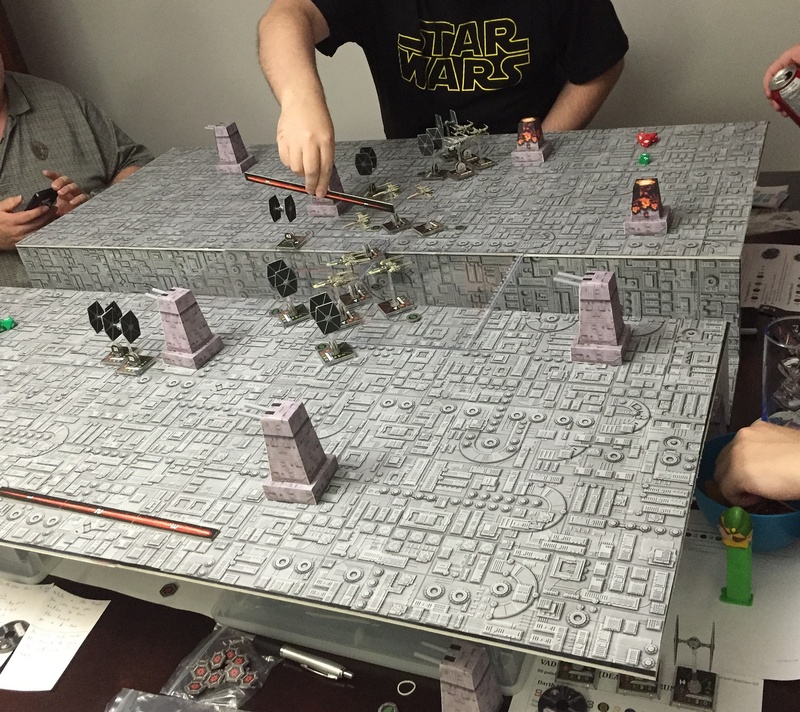 Each turbo laser tower could fire in a 360° arc at ranges 2-3 with an attack power of 4. 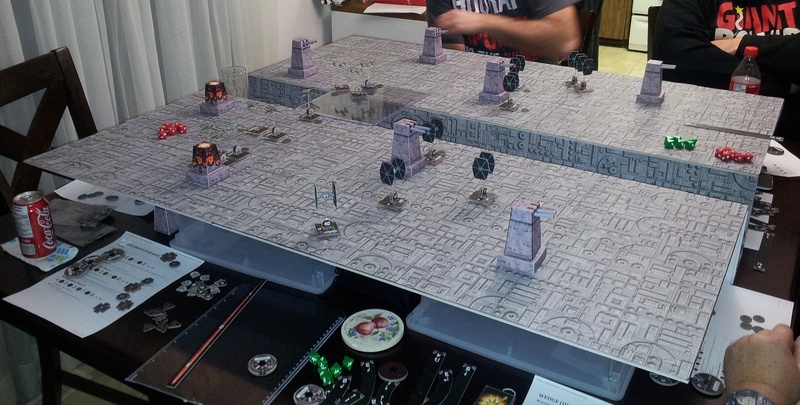 Any crits scored by a tower is changed ti a hit. The towers have 4 hull, no shields, no evades, and could not take critical hits (any crits rolled against them are changed to regular hits). Ships defending against turbo laser fire double their agility when making their evade rolls. 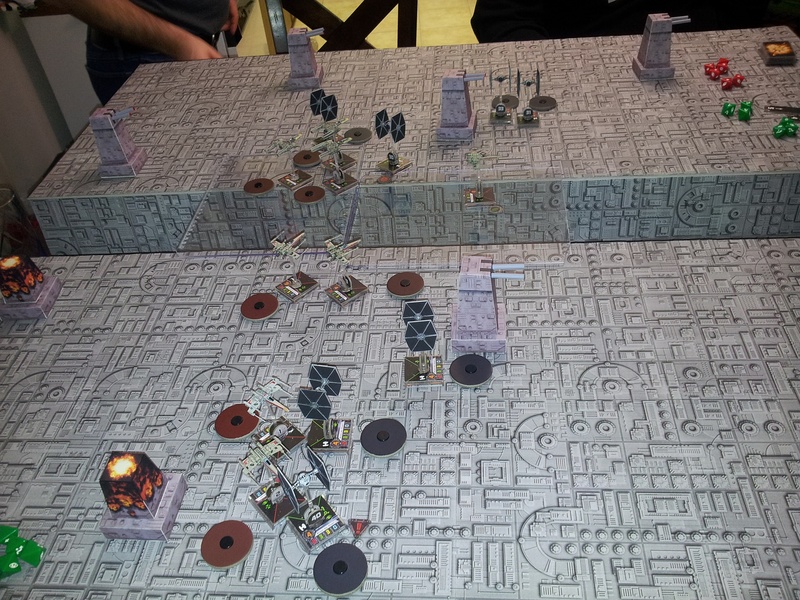 Colliding with a turbo laser tower causes two attack dice worth of damage to be rolled against both the colliding ship and the tower. 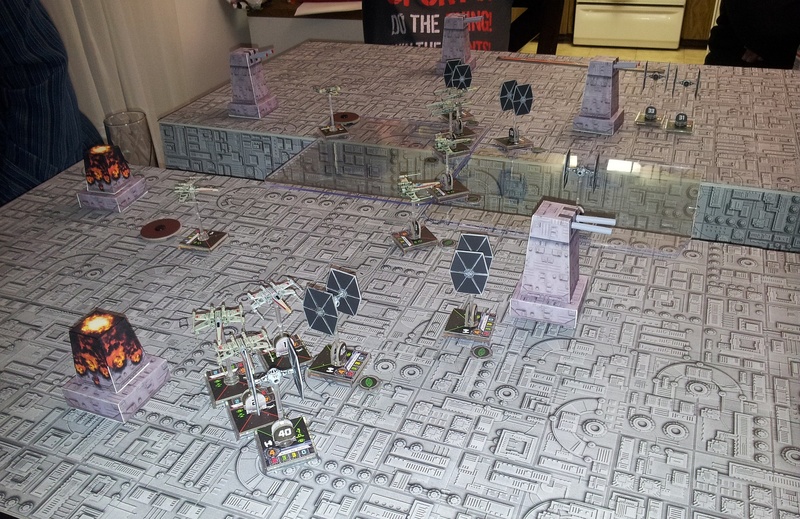 To activate the turbo laser towers, the Death Star generates 5 energy at the start of every round. The energy can be secretly allocated to any turbo laser tower before any ships move. Up to 2 energy can be allocated per tower per turn, and each tower can store a maximum of 4 energy. The turbo laser towers fire after all other ships have fired, and each tower requires 2 stored energy to fire once, after which 2 stored energy is expended. If a turbo laser is hit with any ion weapon, it loses all its stored energy. If a turbo laser is destroyed, it remains an obstacle. 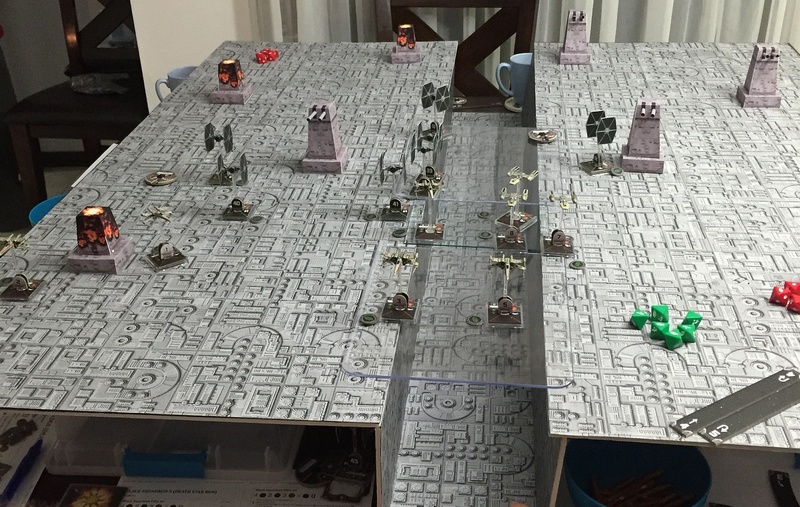 The Imperials win when all Rebel ships are destroyed. 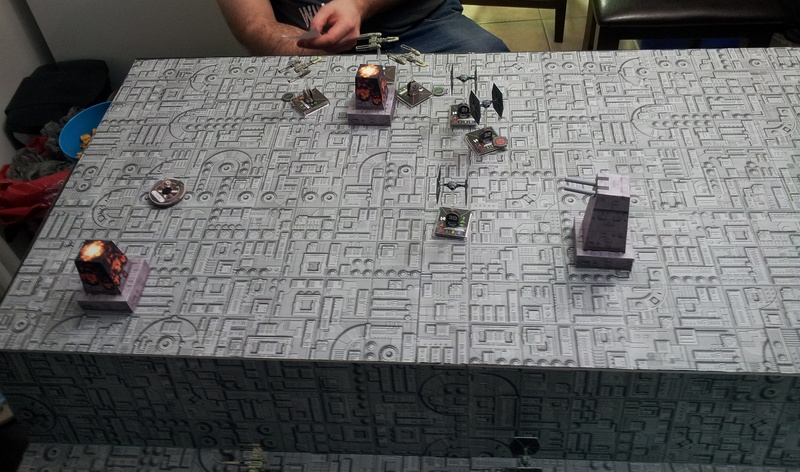 The Imperial players can choose any Black Squadron group to start with and to use as unlimited reinforcements. 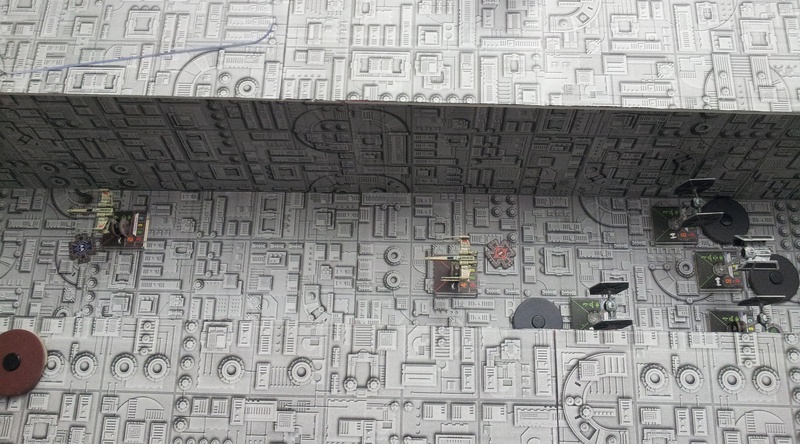 The Rebels deploy on the surface at the end of the play area with the exhaust port. 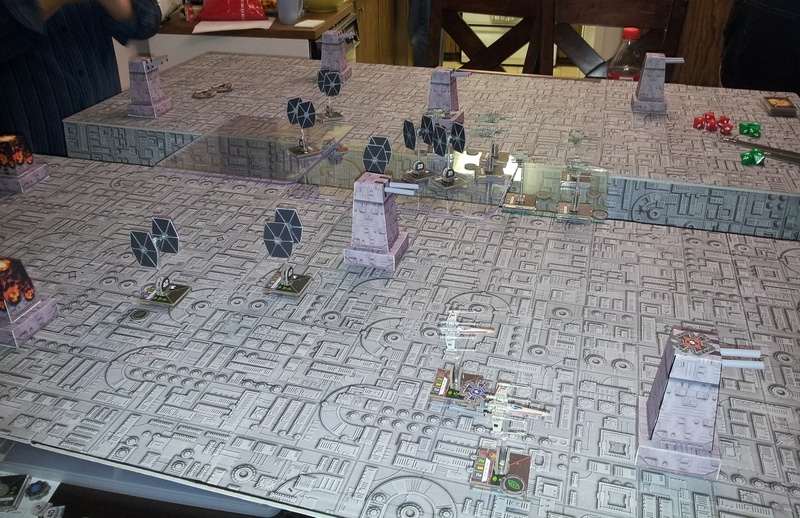 The Imperials deploy on the opposite side. 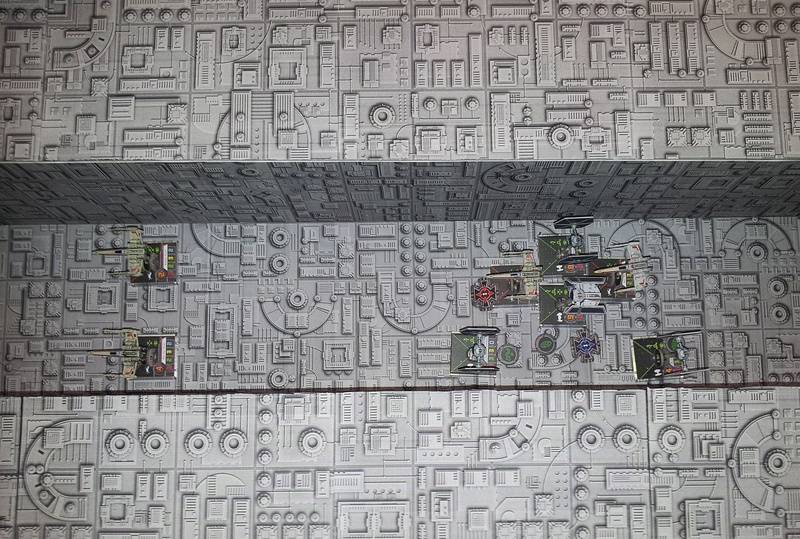 The Rebels must fly the entire length of the surface and off the Imperial edge of the board in order to enter the trench. 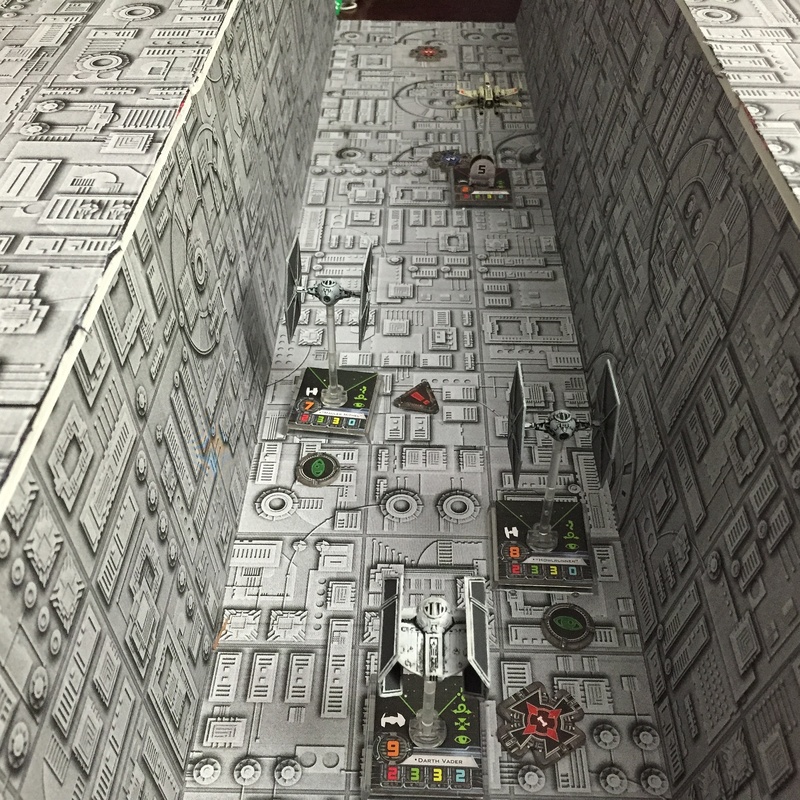 When any ship flies off the Imperial edge of the board, it is taken out of play until the next round where it appears anywhere along the trench during the activation phase and immediately executes its maneuver. 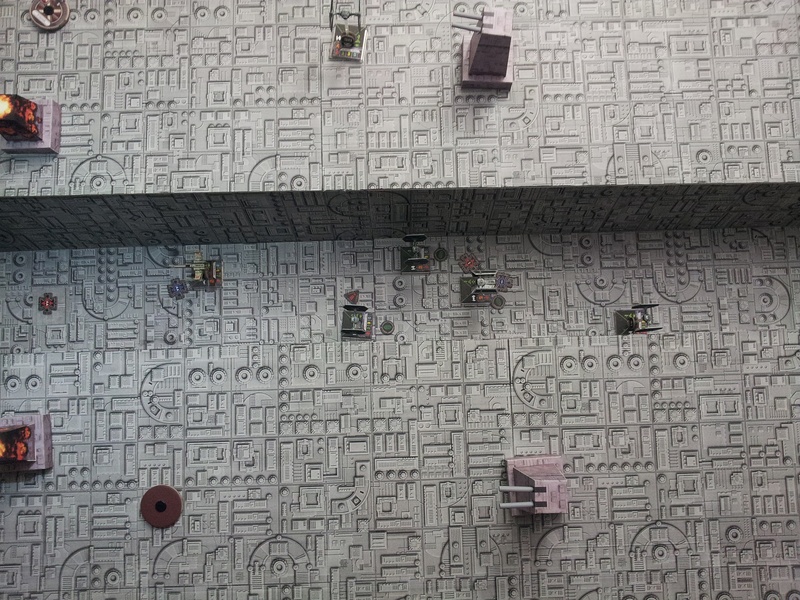 While ships are in the trench, the player controlling the turbo laser towers can elect to also fire the trench guns. The trench guns, when fired, perform a 2 dice attack on all ships — friend or foe — in the trench (each ship being attacked can evade as normal). To exit the trench, the player must either use its action to elevate itself out of the trench or perform a koiogran turn (for the k-turn, the ship would be moved and turned about-face as normal, but it would also be elevated up above the trench). A clear piece of acrylic is used to support ships flying above the trench. Ships above the trench cannot shoot at ships in the trench, and vice versa. To destroy the Death Star, a Rebel ship must target lock the exhaust port and fire a proton torpedo at it (each Rebel ship is given a free proton torpedo which is only to be used for a shot on the exhaust port). The player must naturally roll one at least one crit plus a second hit or crit to succeed. This is only the first time we’ve played this scenario we made up, so we don’t know if any rules needs to be tweaked. 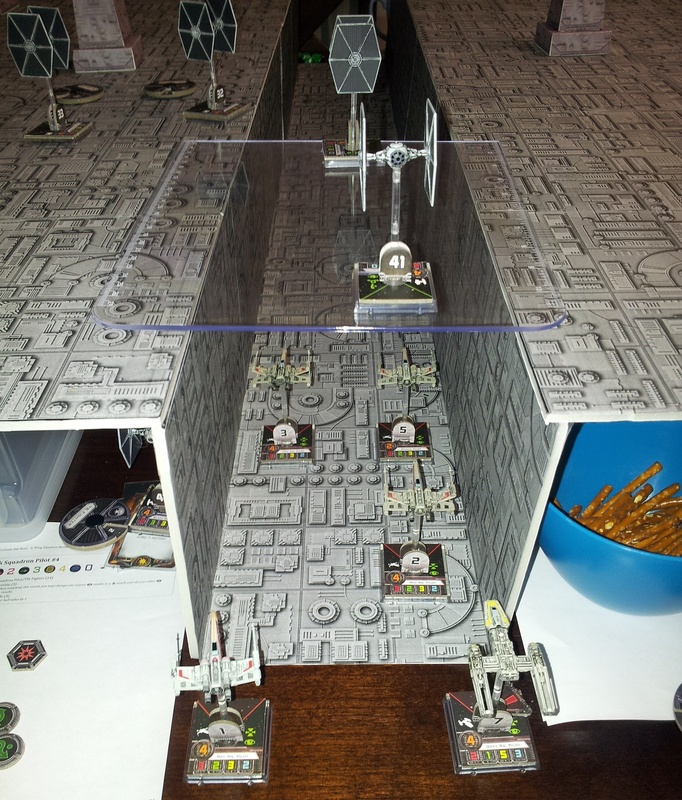 It worked out really well, however, with only one X-wing making it to the exhaust port with a single hull point left, and that X-wing making a successful shot. Two turbo laser towers down! 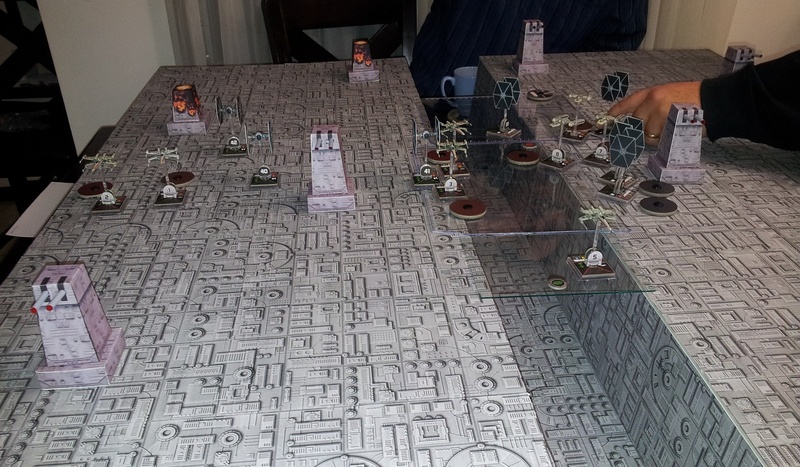 Can the Rebels make it to the exhaust port? 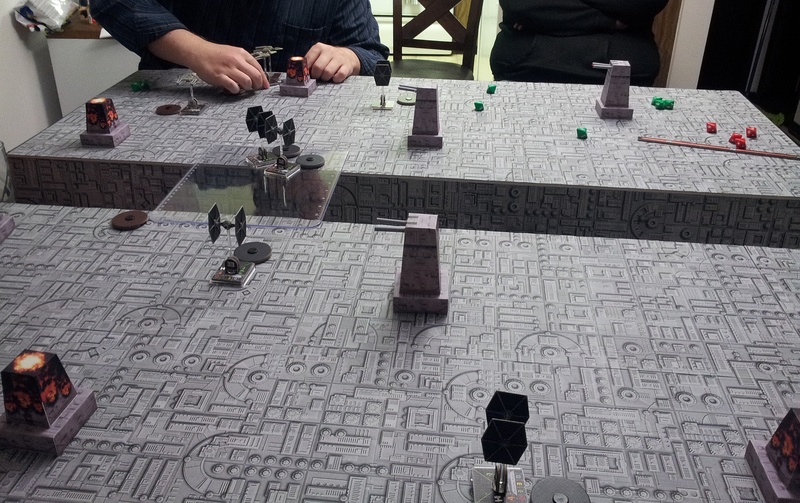 Vader and his cohorts are tearing the Rebels to pieces! Oh no! 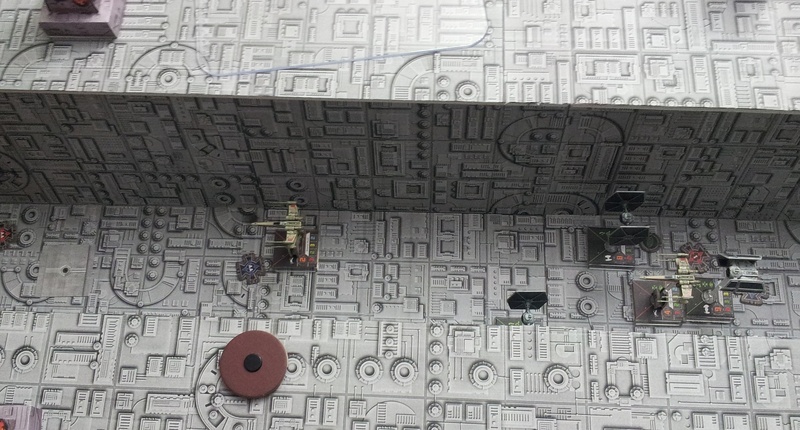 Only one Rebel fighter left in the trench!